...So, could it GET any better? Champagne cake from Nugget Market has been a family favorite of mine for well over 30 years. Yup, I'm old enough to have favorites for that long a time. I think I had my first taste in my teens, not long after we came back to California. My grandmother, Bambi, probably picked it up on her way through "town" (AKA Woodland) on her way from Esparto to Davis. I remember the pink whipped cream frosting and the custard middle. Light, not too sweet, and lovely. No problem eating 2 pieces. Great memories! A few years ago, Nugget Market came to my town. When they opened their doors, I finally felt at home. I lived near a Nugget Market for years in Davis, and that's where Bambi shopped in Woodland for meats and fancy desserts. Love those days. Anyway, as good fortune would have it, I live, literally, down the street and around the corner from "The Nug" or "Nug" for short. Not only was I now able to get amazing meats and stone oven bread (we NEED real bread here! ), finally Champagne Cake whenever I wanted it! Amazing!! When I make this again it will be with fond memories of Bambi and my family. 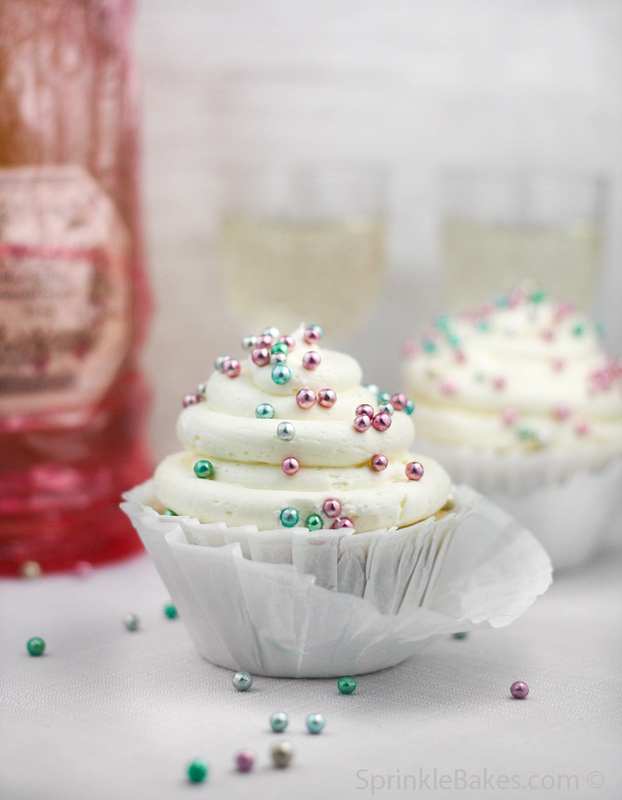 And, I highly recommend a glass of prosecco during the baking and one to enjoy with your cupcake...Both go down really smooth! The champagne cake from the long-gone Burlington Bakery downtown in Santa Rosa was my mom's favorite, second only to their fruit basket cake. It sounds similar: also pink frosting, also light and delicate, but I don't remember a custard filling. I'll have to try this and see if it tastes the same. The Burlington Bakery Cake was decorated on the sides with chunks of something that tasted a bit like white chocolate, but that was a delicate pink color. I loved that stuff and have no idea what it was. Hi Nancy! Love fruit basket cakes. We have (don't know if they are still around...) a bakery in Sacto (Cramers) that makes an amazing fruit basket cake. I haven't tried it in years, though. Also, it is white chocolate shavings on the champagne cakes at the Nug, too. Thanks for checking out the blog and for being our first Follower! Amazing! I just stumbled accross your blog. I don't have a baking blog, but I do make what my friends call "Drunk Cakes" or cupcakes made with alcohol so I was very excited to find your site for some good ideas and recipies!